Perhaps the highlight of this long winter has been keeping track of the daily changes going on inside. I usually get a more complete picture on Friday nights when I clean the living room and swap out dirty cages for clean ones. Getting a feel for the youngsters’ progress, and the general health of the flock, makes the cleaning chore something I look forward to. Like snowbound romantics, the adult finches have been nesting and reproducing apace. I may have already lost count. 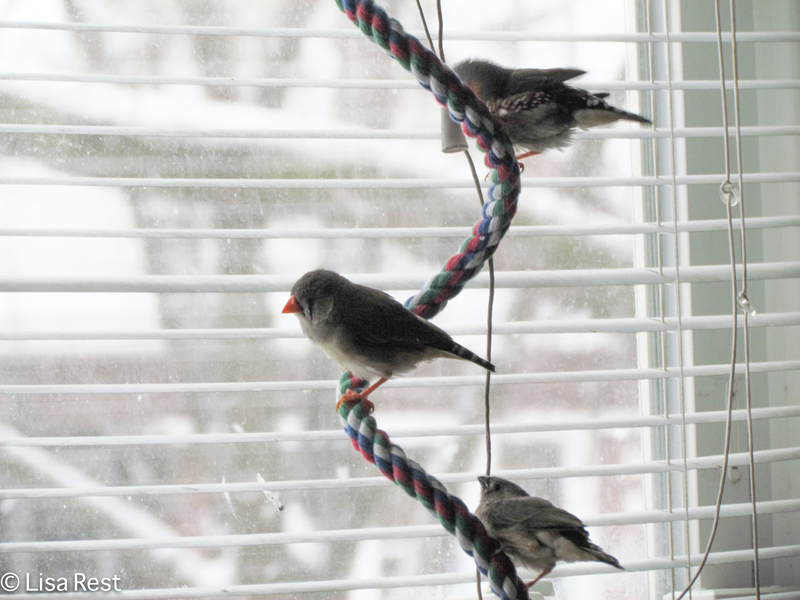 There are four new Zebra Finches as of last week, in addition to the original five which are nearly grownup. It will take a while before I can name any of the Zebra Finch kids that have turned out to be males, but here’s a little video of the oldest one from last week. His song was still pretty shaky. Today it’s beginning to take shape. The Zebra Finches are turning out in different shades which makes them even more interesting. 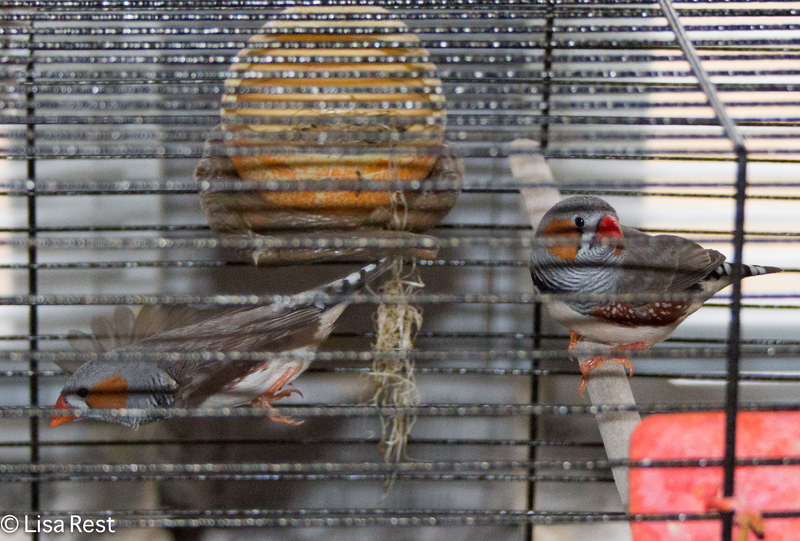 I have never had champagne-colored Zebra Finches before and now I have two. Below is the newest one, with two siblings in different shades of gray. It’s hard to get decent pictures during the day with the light pouring through the front windows but the basic idea here was just to show maybe half of the birds at one time. 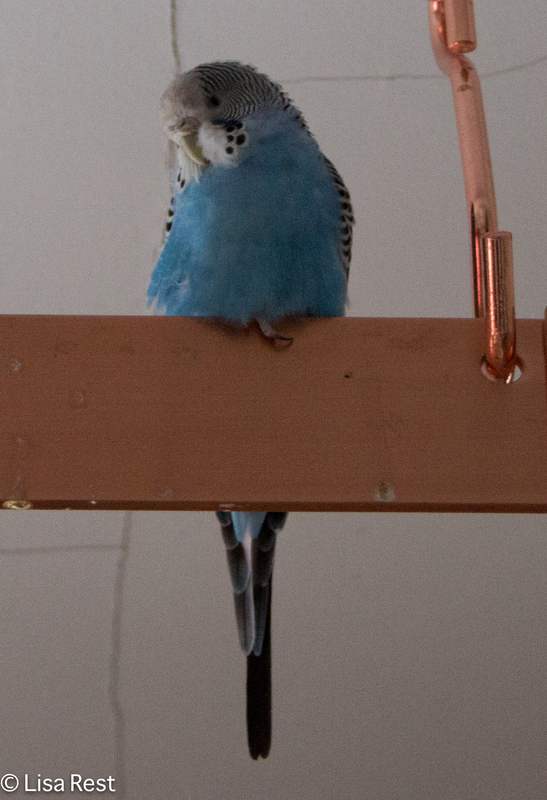 As for the two birds not finches, my remaining Budgie and the Diamond Dove, I did manage to capture Blue and Dudlee preening each other in the video below about a month ago. There were a few nights spent together as well before Dudlee went back to sitting on her plastic egg nest in the kitchen. On days I go to work I carry her, sitting on the nest, out to the dining room and put her behind the sheet covering the hutch so she has privacy. 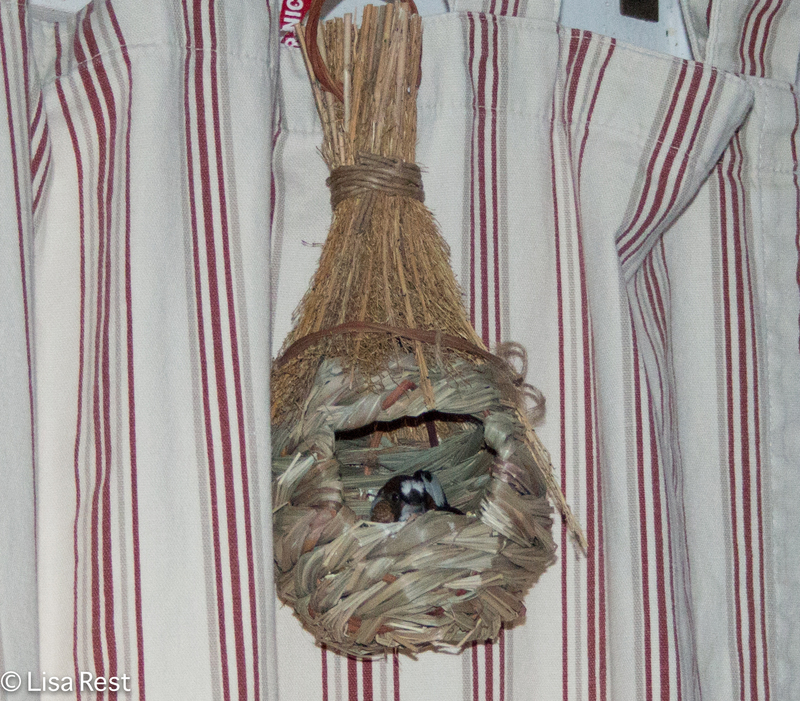 When I come home at night she’s flying around, cooing and making sure I don’t forget to put her nest back in the kitchen. In general, the kitchen is everybody’s favorite room. I don’t know if it’s because it’s forbidden territory when I’m at work or if everybody just likes being where the food comes from, or a bit of both. On the Society Finch front, after Trevor and Tina created Treasure, who has since turned out to be a male following his father’s singing tradition, Trevor produced eight more through his couplings with Phoenix and Rikki. Seven have survived, and I heard a little subsong going on today with at least one of them. 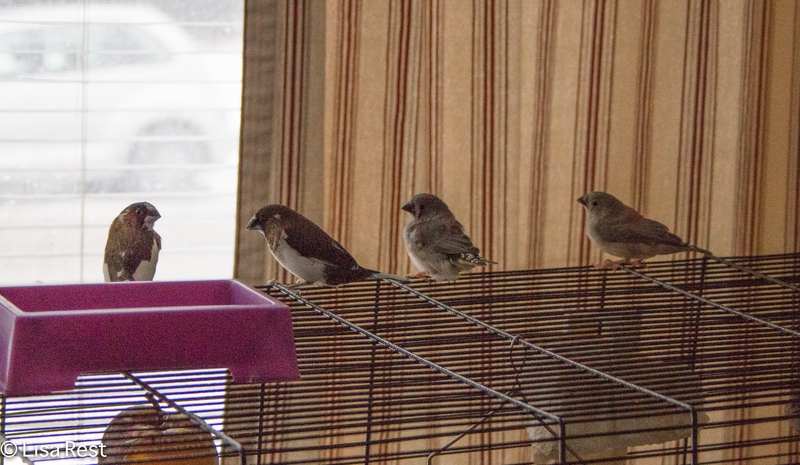 The Society Finches live up to their name much of the time and hang out together in a tight grouping. What’s perhaps funniest is to see them all piled into a nest together for the night. 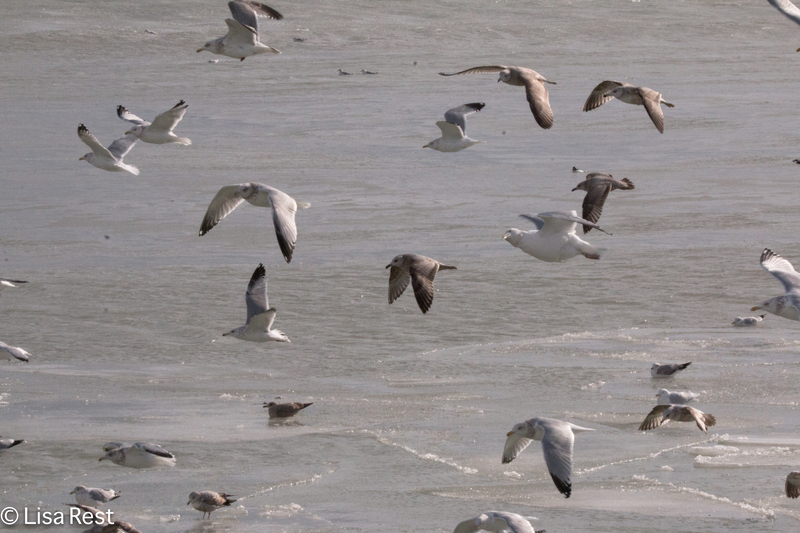 I will be back with some pictures from the weekend’s local birder winter social event, the Gull Frolic, after I manage to sort through them all, which could take some time as I try in desperation to figure out what isn’t a Herring Gull. I’m really not spending all my time on the futon but it’s been a rough week weather-wise so it’s perfect to sit with my feet up under the quilt, watching and listening to the birds. 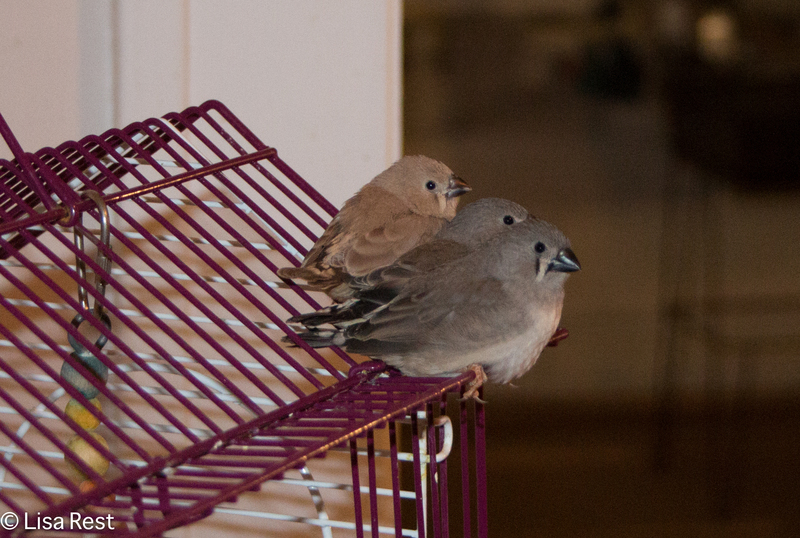 When I last posted about the indoor crowd, there was only one fledgling, a Society Finch I think I just named Treasure. 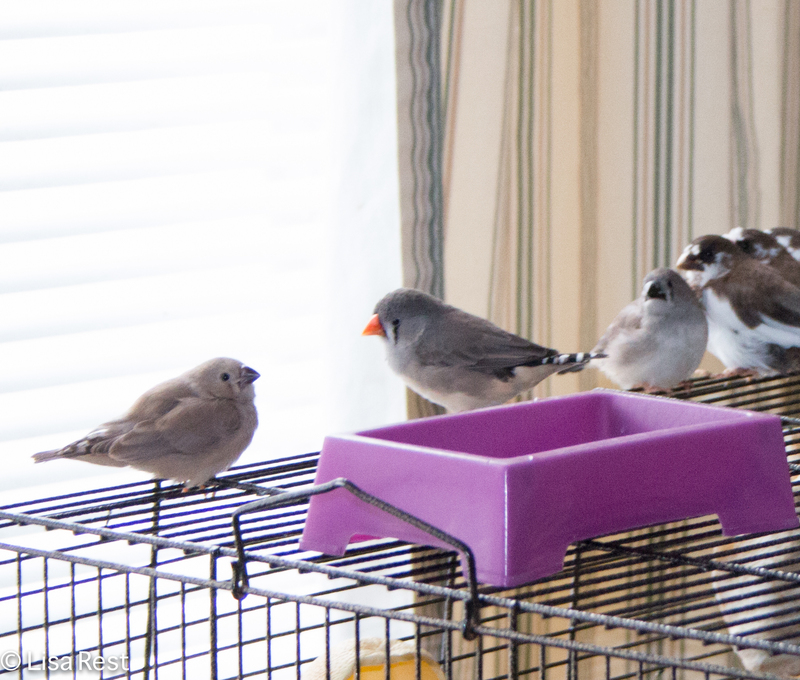 In the last week, five Zebra Finch Kids have fledged, and they are somewhat easy to tell apart for the moment as they are all varying shades of gray. One in particular is much lighter than the others (a sibling of the first to fledge group of three), and the last two are quite a bit darker than the rest. The Zebra Finch adult couples hang out together quite a bit, going on foraging expeditions, and then at other times they get into territorial squabbles that sound ferocious to my ears, but nobody’s suffered so far from being chased. I have noticed today that the fledglings are still begging noisily but they’ve been ignored at times. They have also started picking at spray millet and experimenting with foraging in general, so I suspect they will be weaned very soon. 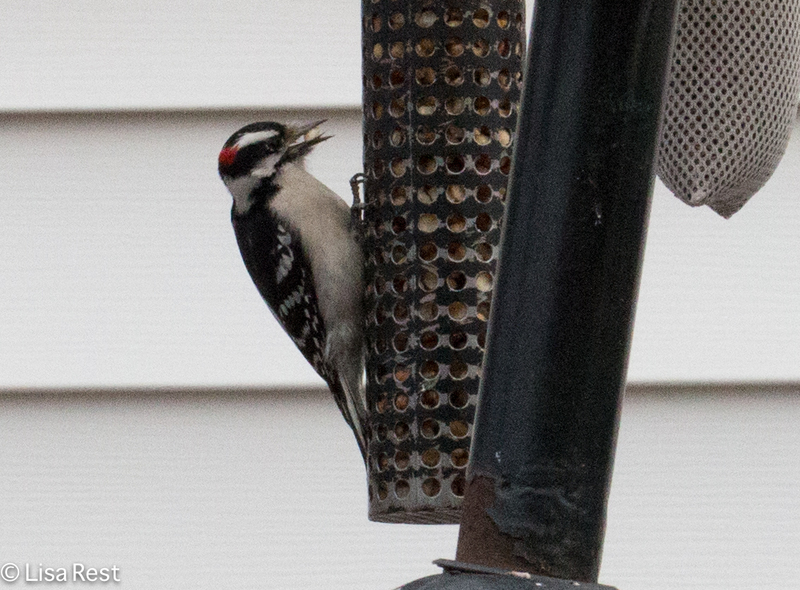 The video has the new fledglings eventually all on one perch, and Arturo T. singing half his song at the end. 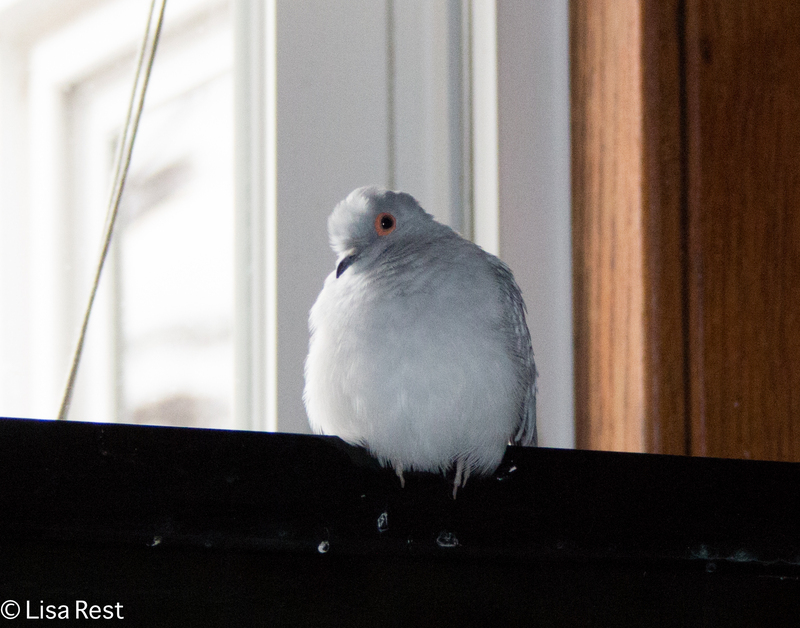 I have no new pictures of the last remaining Budgie and the Diamond Dove, but Blue Budgie sits in the kitchen and serenades Dudlee Ann, the Diamond Dove, from time to time. He is absolutely smitten with her. Whenever she comes out into the living room, he is right by her side. When she takes off for the kitchen he zooms right after her. She is fond of him, but feels a duty to sit on her plastic eggs. 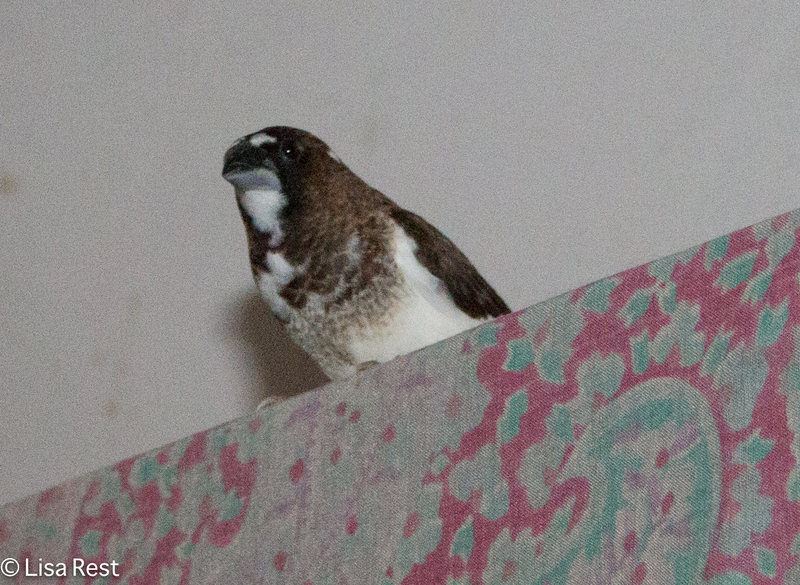 Last night she came to join him briefly on his perch in the second finch cage, but then left for her nest. During the week, Dudlee talks to me and tells me when I come home from work that she wants to go back into the kitchen and sit on her plastic eggs, after spending the day with the other birds. 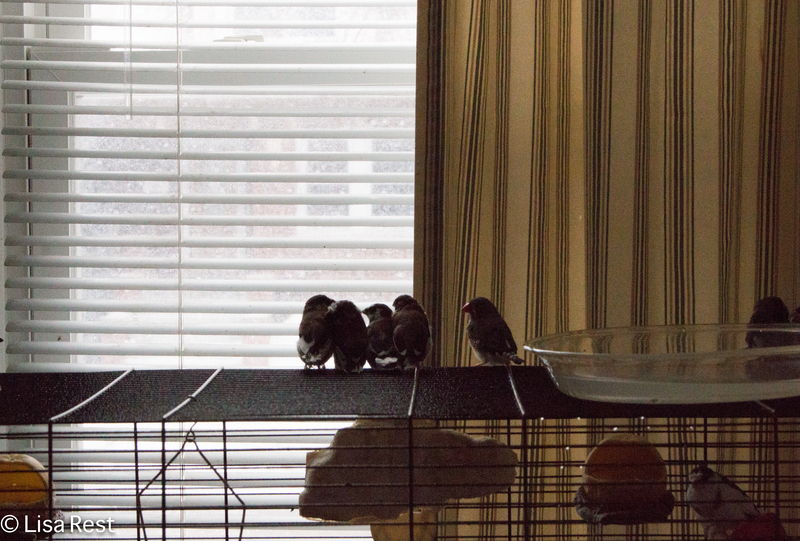 The Society Finches will increase by at least two, as far as I can tell from the sounds coming out of Phoenix and Rikki’s nest. I suspect they are Trevor and Phoenix’s offspring. The nicest thing about all this is that everybody has settled in, we are comfortable with each other, and now I have birds born in the house again. I am looking forward to seeing the Zebra Finh fledglings turn colors, become either girls or boys, and particularly to hearing the boys working on their songs. Arturo T. and Ricardo M. keep working on their songs and they have fleshed them out considerably since they arrived fresh from the pet store. Arturo T. has the most lyrical song, and I have figured out how to put “Arturo, Arturo Toscanini” to it. Ricardo’s song is more percussive and I haven’t figured out how to add his name to it yet. 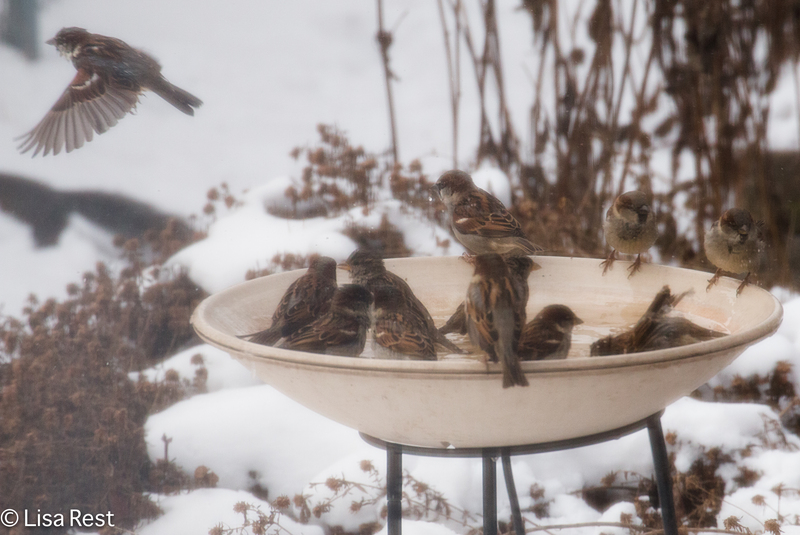 Meanwhile in the yard this morning the House Sparrows were all hanging out at the pool. My view through the kitchen window. It is snowing again. Cold, but not quite as sub-zero as last week. I hope to visit my crow friends soon. There’s a lot to be done around here and I am doing absolutely none of it. I was improving Tuesday with my right knee when that same night coming home on the train an unfortunate move put me out of commission, so I was forced to take Christmas Eve off from work, which produced little on my end except for a lot of indoor bird observation, reading the paper online, accepting sympathy from friends and succumbing to naps. I did play a little piano. As I’ve been sharing a lot of time with the indoor birds lately, listening to the begging sounds of new baby birds has been the highlight of my existence. A reminder that I have to get better because I have birds to take care of. And I will do anything for my birds. Even if it hurts. We were promised a break in the clouds for Christmas, after the promise of rain turning into snow did not pan out. The sun did manage to peek out from the clouds this afternoon, which greatly improved our moods. It has been so dismal and gloomy (or “glismal” as my mother used to say), I think we broke the record for days in December without sunshine. 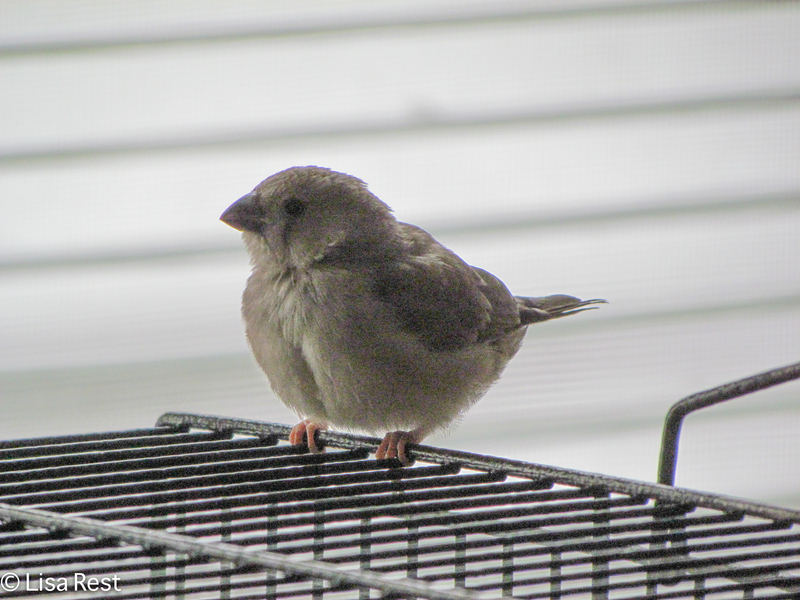 So I listen to the baby birds: the Society Finches, who sound like you would imagine baby birds to sound, and the Zebra Finches, who sound like someone shaking a box of pins, that grows gradually louder day by day. I have taken to calling them The Pins. You can hear them helping me read through a little Bach D minor prelude (the last English Suite, finally). The next time you hear them they will be twice as loud. And the songs and personalities of the new finches are starting to reveal themselves. I have decided to name the two male Zebra Finches Arturo Toscanini and Ricardo Muti, seeing as how their songs have yet to be formed enough for me to write them out and provide lyrics. Arturo has been working diligently on his song and it is the most developed. I suspect he is the alpha male. The clip below is of Arturo singing with a little Mozart. 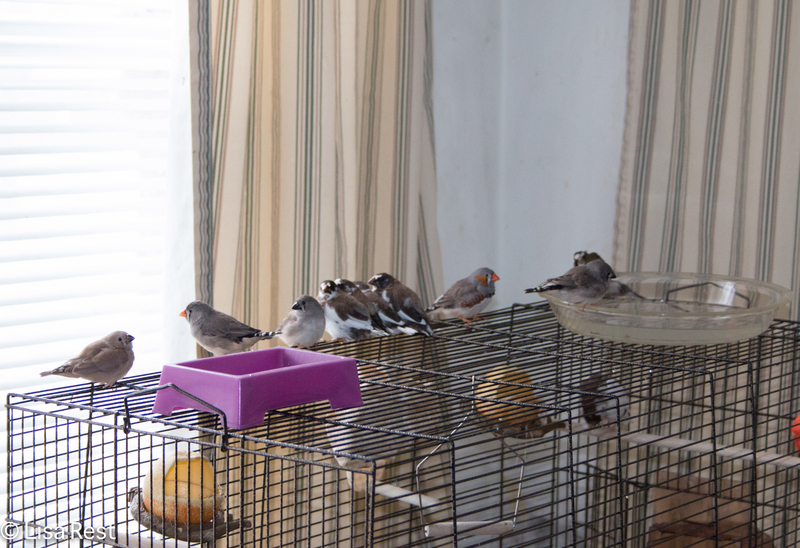 I am also feeling a little better about my Zebra Finch matchmaking, it seems to be working out. At first I thought it was stupid of me to throw two males and two females together and expect them to get along, and they seemed to be out to prove me a jerk, but now they seem to be getting along more than they chase each other. Things were not so rosy with the Society Finches either. I had Phoenix and Rikki, the two hens from before, and introduced Trevor and Tina. Phoenix and Rikki abducted Trevor after a while, and at one point Phoenix seemed to be taking over Tina’s brood, but I think everybody is together for the common cause now. Tina is back in the nest, although when she does come out she proves to be a beautiful bird. I am looking forward to seeing the offspring. 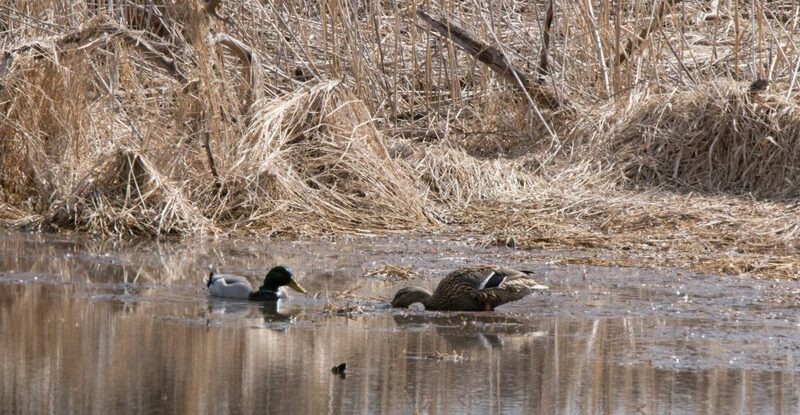 I have not been able to determine whether Trevor has successfully mated with either Phoenix or Rikki although I thought I caught him trying once with Phoenix. Phoenix and Rikki are finally over the shock of realizing that I am not throwing out eggs, as I did for months before with their previous crowd, but that’s a long story. Now I have all young birds and they should reproduce while they can. Below is a clip of Trevor singing with a little Mozart. 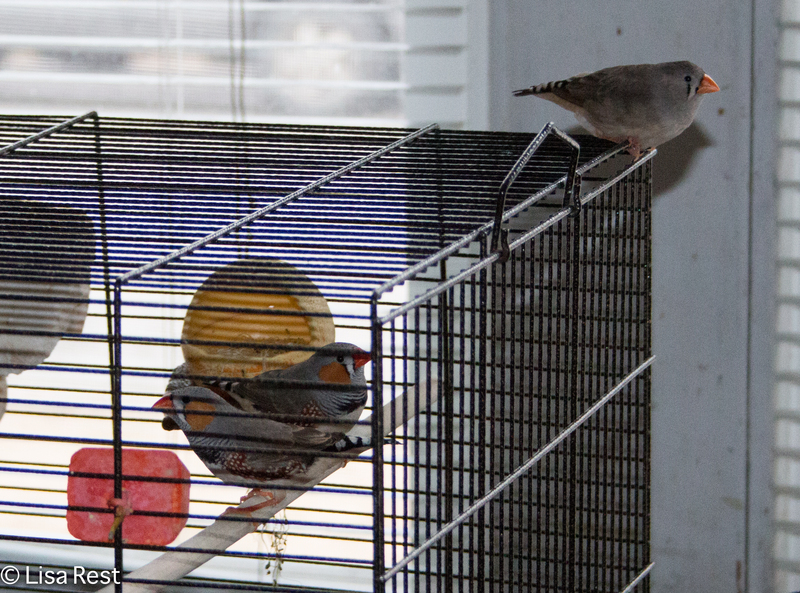 Blue, the Budgie, and Dudlee, the Diamond Dove, take refuge from the finches together. Dudlee manages to find new hiding places, and she throws her voice when she coos. I have a hard time locating her, especially when I’m less mobile. I have simply decided that the only approach to the knee, besides seeing a surgeon for his opinion in a couple weeks, is to get as much rest as possible, do whatever physical therapy exercises are feasible, and walk as carefully as possible. Stairs are now a terrific challenge and I am trying not to mess up my other knee by asking it to bear all the weight. I suspect in part getting a shot in the right knee was a gamble because I now have pain at the point of insertion. But as bad as my memory for it is, I got through all this once before and so I should be able to do it again. And embrace the reminder that I am not invincible. There’s much to be done, or not done, while prone. Lastly among other things I have had to give up since this incapacity took hold, I regret not making traditional food gifts for the holiday. I used to do a million cookies, but in the last few years I have tailored the baking effort to several loaves of cinnamon oatmeal raisin bread, but this year if I manage to get to it at all it will be for the New Year’s Day instead. The only time I got behind a camera lens that wasn’t my cell phone was last Sunday, when I managed to get a few pictures of regulars who visit the yard. I hope to be back soon with something more cheerful than a bad knee report. Hope your holidays are much merrier! I got home tonight around 11:30 PM after a day spent traveling back from Costa Rica. I will write about the trip in future posts, But I feel I must come to the page about what has just transpired because I am still trying to figure it out. Prior to leaving I was scrambling to put together better bird-care instructions for the new bird care person I had found. 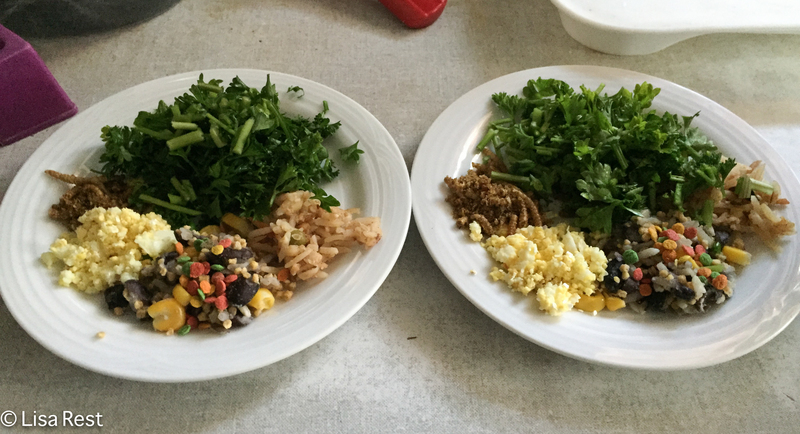 I trusted him to follow the instructions which came with pictures of how everything should look. The instructions were detailed and when I ran out of time to finish adding all the pictures, I believe I wrote copiously about every step. The pictures and these short videos were taken with the iPhone. While I was taking pictures of food preparation, I also managed to get a video of Zorro singing. He appears in the video above. Sitting in the airport in San Jose this afternoon, I got a disturbing text message from the bird care person I had hired for the second time. He told me 6 birds had died and he was upset, because he thought he was following all the instructions. Two of them, he said, were the ones that were failing. 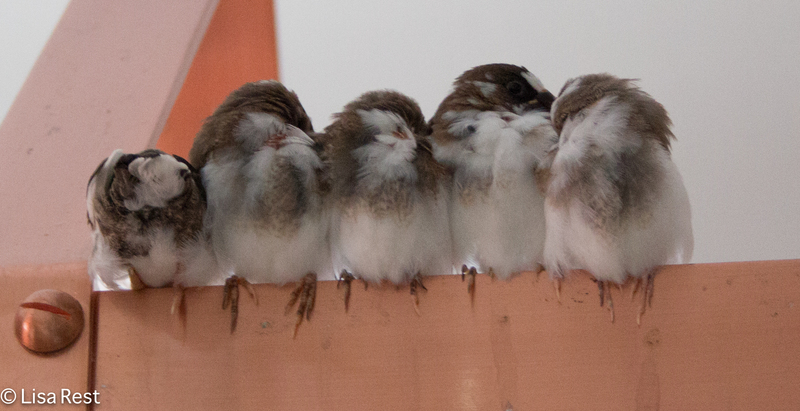 I asked him if the other four were the rest of the Zebra Finches. He said yes. 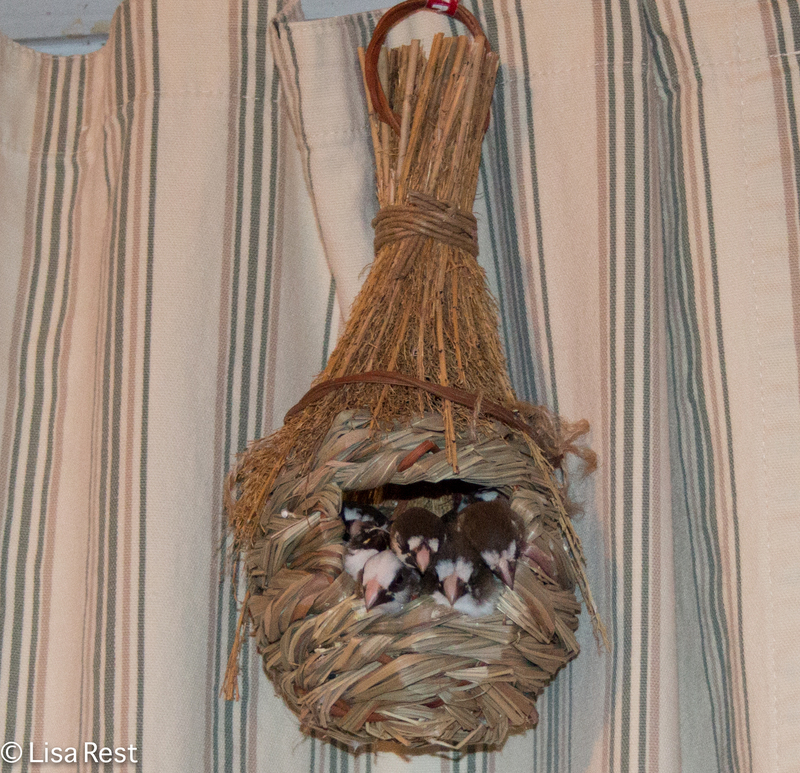 I came in the house tonight and was shocked to find only 3 birds. 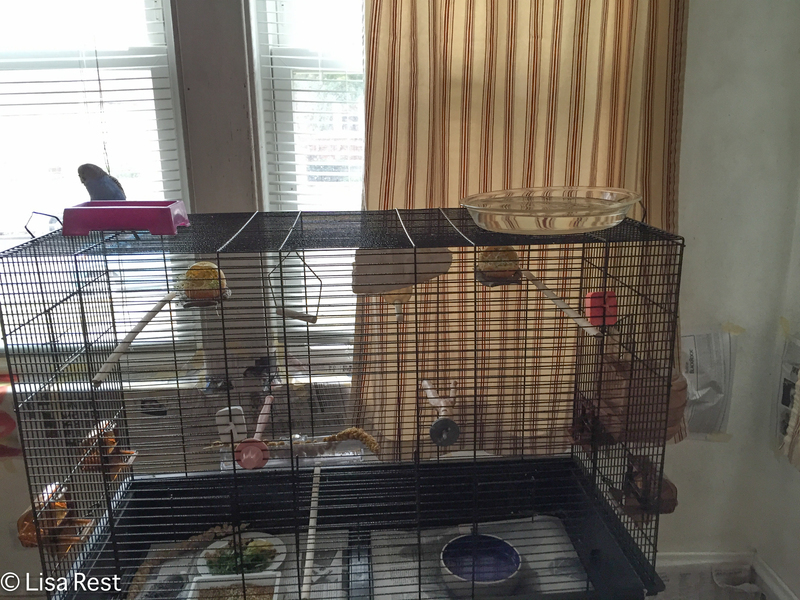 One budgie and two Society Finches. 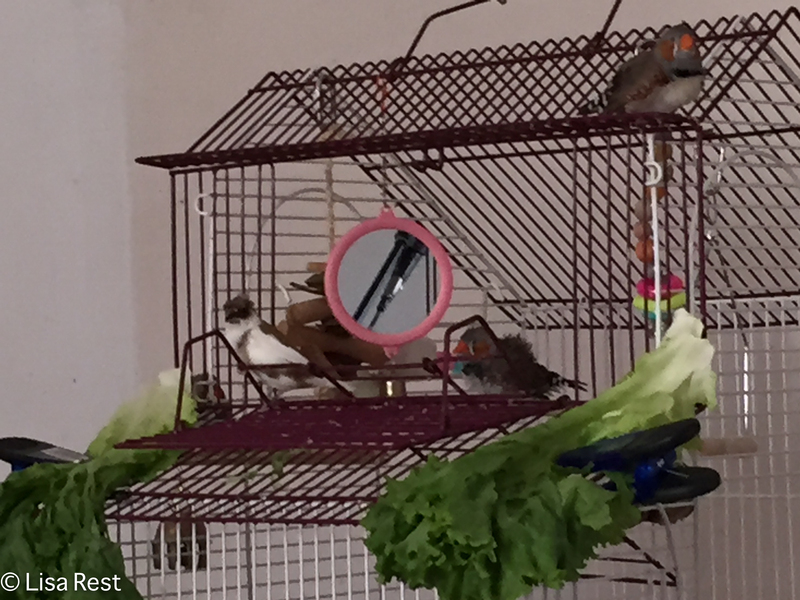 When I left I had 17 birds: Two budgies (one of whom was on his last legs), five Zebra Finch males, two Spice Finches and 8 – yes 8 – Society Finches, including my two little singer guys, Hector and Franklin. Neither one of them survived. I have found some corpses but not all, and I will not elaborate on where I found them. I have found none of the Society Finches. They were very young and the healthiest. I have two left, but I’m not sure if they are the two females that came with Hector or their daughters. Well I guess I don’t have to worry anymore about them multiplying. But I am devastated. I cannot imagine what was done or not done to kill 13 birds in a little over one week, when I have left birds for up to three weeks before this. And I am wondering what I should do. 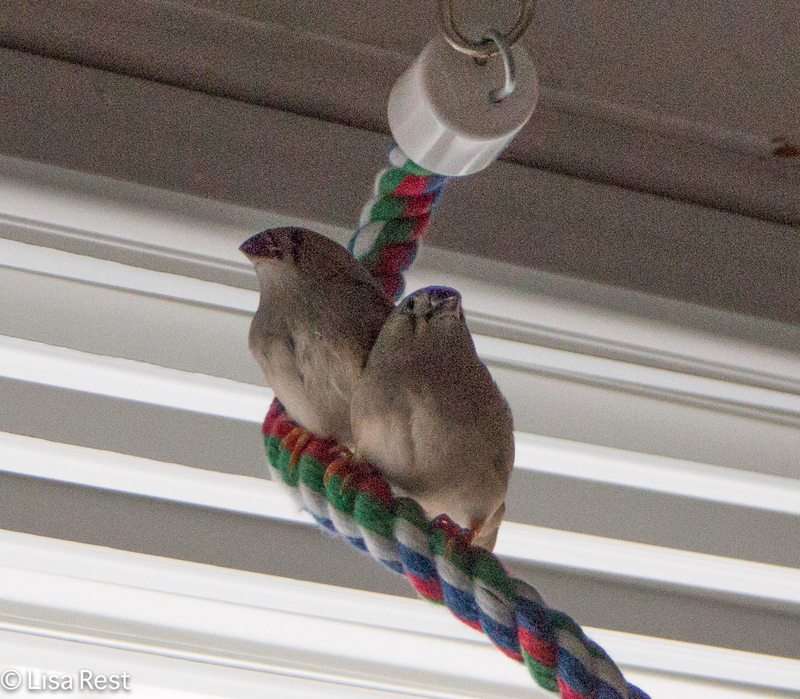 My first instinct is to try to find more birds – not 14 replacements, but at least a couple young Zebra Finches that would reproduce, so I could have several little songsters again. But then I wonder if it is wise to take on another 12-year project at my age. 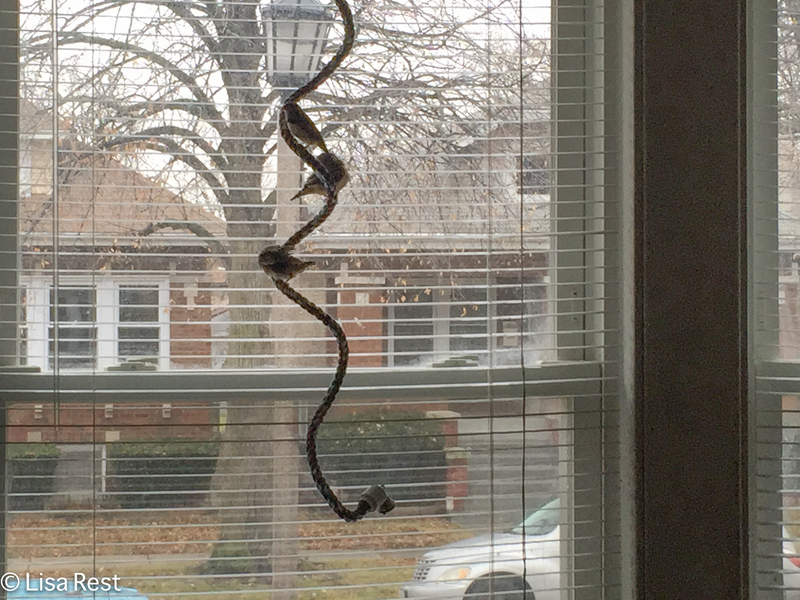 Is this a sign that I should stop playing music for birds? Should I get used to silence and being alone? I don’t think I could stand it. I guess I will know the answer when I wake up to silence tomorrow morning. It will take me a week or two, perhaps, to sort this all out. I will be looking for birds, perhaps, but I am not taking in just anyone. And I will certainly be looking for another bird care person when I decide to travel again. It won’t be any time soon. R.I.P. Hector, Franklin, Gregorio, Zorro, Beniamino, Adolfo, Pietro, Beau Budgie, Marty, Johnnie, Isabella…and one whose name I can’t remember presently, if Phoenix and Ricki are still with me. Still coming down from a weekend of intense but wonderful birding in Michigan. I might have managed a post Tuesday night were it not for a power outage around 8:00 p.m. that lasted three-plus hours. But it turned out to be an unexpected opportunity to catch up on some sleep, after whispering admonitions to the house birds to stay perched and sleep through the thunder and lightning. 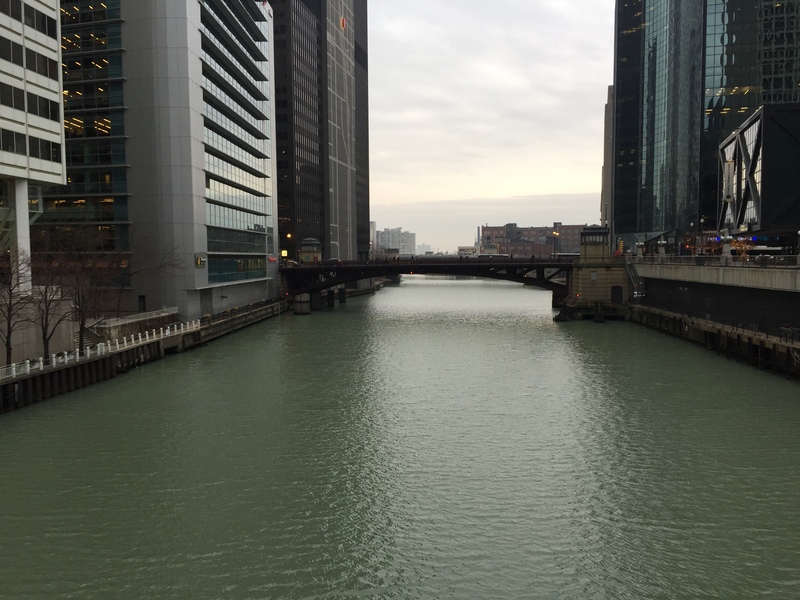 So I got up early yesterday morning and went to Millennium Park, dodging the imminent rain drops. Flycatchers were abundant, as reported from other lakefront locations. The real surprises, or I suppose you could say wish-list possibilities, appeared in Lake Shore East Park yesterday afternoon. 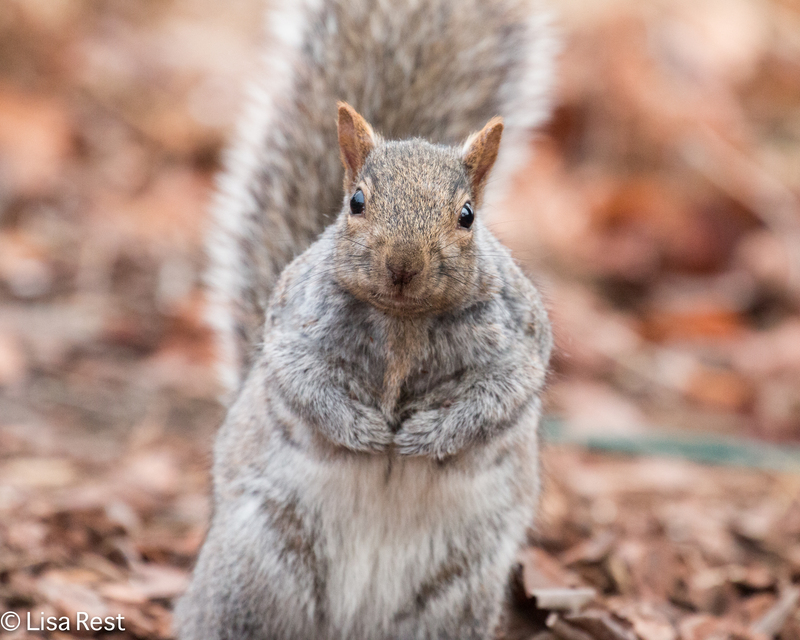 I went back this morning and could not find them… One was the prized Connecticut Warbler, skulking around in dark places: I guess the photograph below will have to do for now. Add a female Common Yellowthroat. Perhaps she is the mate of the male who was singing yesterday and again this morning. 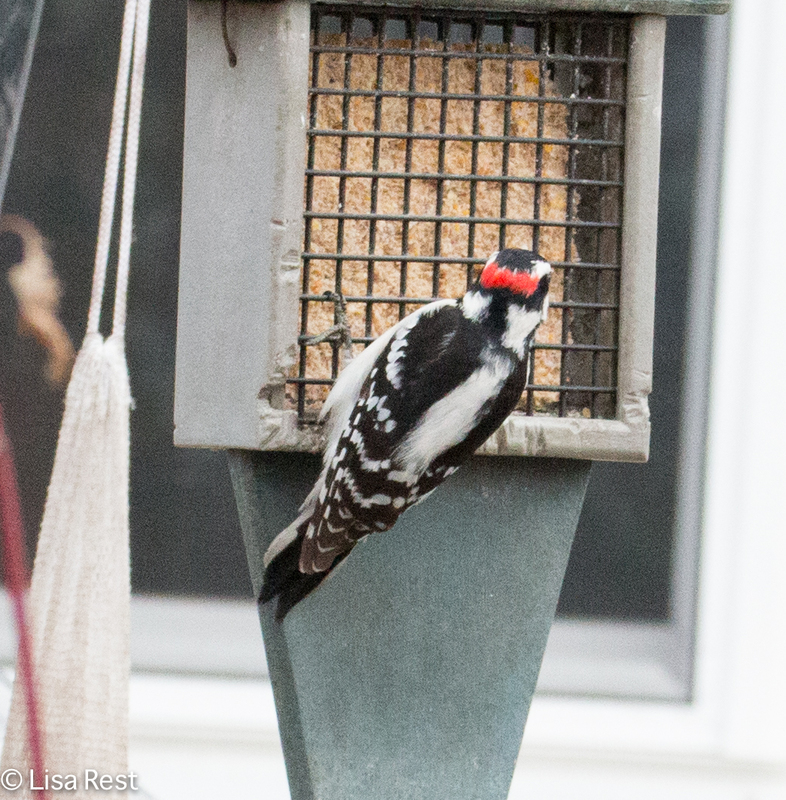 She is the least uncommon of the three birds here, but lovely nonetheless, and easy to confuse with the other two. Thus we have three skulkers who all look quite a bit alike, and in most field guides they’re not far from each other, so you can make the comparisons and note the differences or throw up your hands in total confusion. Not to skimp on flycatchers, the one above is at least recognizable as a Pewee. He sang a bit, too – always nice to hear. If I run into a Pewee song soon I’ll update this post. On my way out, I walked through the back of the Aon Building where I have seen birds on occasion, and encountered this crow with its prey: I suspect it’s a little brown bat. The crow took off with its bat soon after I shot a few more photos. I’m sure it didn’t want me to draw attention to its prize. My last momentary offering is a recording of Beniamino, one of my Zebra Finch males, singing his heart out from atop a microphone while I’m practicing the prelude to the F major English Suite by Bach (it may take me a year, but I’ll get through these suites – 2 more to go after this one). Travel time has taken its toll on playing for the birds but I plan to stay put for a few months and get some more music in my fingers. Endless thanks to all who follow me and to those I follow – I have some catching up to do! I’ll be back soon with reports from Michigan and the Kirtland’s Warbler.